Have you ever dreamed of opening a restaurant? It’s a common fantasy for many of us foodies I believe. For this postcard I interviewed the owner of a new restaurant in Aix with a very uncommon background for a restaurateur. And, because we are discussing the food business, I thought I would share with you the food on my lunch table today, fresh from the open air market behind my flat: a small baked tart of spinach and local goat cheese, sun dried tomato tapenade spread on warm baguette slices, local green olives marinated in garlic, a small side dish of mache (lambs lettuce) mixed with my secret vinaigrette (happy to swap recipes), a sweet clementine from Corsica (the best! ), a wedge of creamy Tome de Provence (goats milk cheese), and a glass of white wine from the Burgundy region (chardonnay). Food for thought and inspiration. 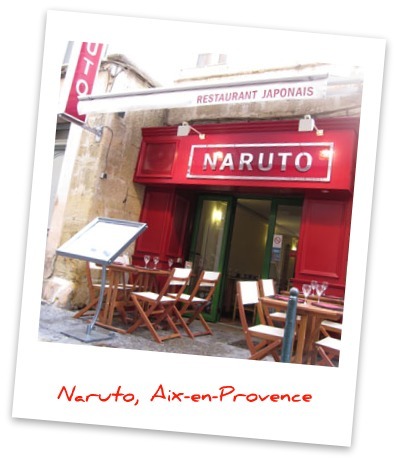 I first noticed the Naruto Japanese Restaurant last Autumn while wandering the narrow back streets near my favorite hotel in Aix-en-Provence. I was making regular weekend excursions here from Fontainebleau at the time to look at apartments, and got a quick chuckle from the restaurant name. For readers without kids, Naruto is a popular Japanese Manga series that approaches cult status amongst adolescent boys, and both of my sons have passed through the obsession. Looking for your 11 year old? Chances are good he is at the Borders with his hoodlum friends, planted on wooden benches with pages pulled open over their knees, plowing through Naruto paperbacks one by one. I made a mental note at the time to try Naruto when back in Aix more permanently with Jess and so we did. The backstory on the small restaurant is interesting, and I have decided to introduce its owner – Koiche Kunibe – as my first Passion in Action profile. I am curious about the personal missions others pursue, like to hear about their challenges and triumphs, and learn what I can from their experiences. I look forward to sharing more of these profiles with you through the Postcards blog. Koiche Kunibe was born and raised in Osaka, Japan. He earned a degree in chemical engineering there and like many ambitious Japanese moved post-graduation to Tokyo where he was hired by Fujitsu, a global conglomerate and leading supplier of semiconductors and electronic systems. Koiche continued his career in semiconductors with Tokyo Electric, which also built the Fukushima Daiichi Nuclear Power Station that has been occupying the news. Koiche was a successful European business manager for Tokyo Electric and would spend 90 days at a time, as much as his travel visas would permit, on the continent living out of hotels. Under the strain of this transient life, he requested and received a permanent transfer to the south of France, an active centre for the semis industry, in 2000. We sat down for a chat over espressos last week, just before opening hour at Naruto. I anticipated a tortured story of young ambitions denied and mid-life chances taken, a gutsy tale of sacrifice and perseverance. What I learned was less quixotic, but equally bold and impressive. Koiche did not grow up harboring dreams of being a famous restaurateur. Rather, he was frustrated with lack of promotional head room in his engineering career. He is ambitious and was not finding the space to accomplish, and get rewarded for, his ambitions within the conformist structure of Tokyo Electric. The French countryside is dotted with beautiful old estates and Koiche would love to be a lord of the manor someday in a grand bastide. This was unlikely to happen on his engineer’s salary, but Naruto offered that possibility, …. if successful. Why a restaurant? Well, why not? Koiche had a close friend with a Chinese restaurant in the area and his business was flourishing. The more they spoke the more Koiche considered the logic of a new Japanese restaurant in Aix, a city with many walk-ups offering mediocre sushi take-out, but few quality Japanese restaurants also offering donburi, yakitori, udon, and other traditional Japanese selections. What did Koiche know about the food business? Absolutely nothing (say it again). But there is little that plenty of careful planning, focused training, and a pair of big cahones cannot accomplish. In an earlier postcard I wrote about the need for a Passion Plan before embarking on our personal Missions. A well thought-out timeline of milestones that provides a map from now, time 0, to one’s target second-life destination. Koiche had such a plan. He first needed to learn the restaurant business from the bottom up, so took an entry-level job with a Japanese restaurant in Marseille, washing dishes, serving customers, and finally preparing sushi in the kitchen. Hearing about this “career transition,” I imagined his wife’s face when explaining that he was giving up his comfortable, stable engineering position to take a minimum wage job waiting tables. Come again? He considers the year spent at the Marseille restaurant a painful but necessary internship. Koiche also needed an understanding of French rules and regulations around restaurant ownership and management, and an idea of the food chain in the food business: where to buy what from whom and under what terms and prices. He got some of this information from his Marseille experience, some from his friend, and much from plain trial and error. Koiche will tell you that setting up his business was a struggle, he made many mistakes, and was manipulated and taken advantage of more than a few times. 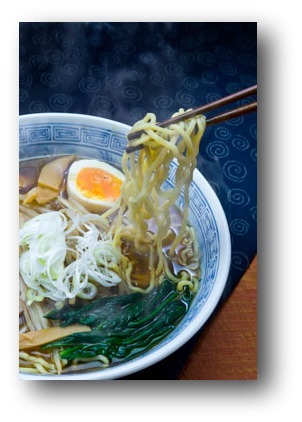 He has a good laugh when friends, envious of his success with Naruto, suggest with a certain glib dismissiveness that maybe now they will open their own restaurants as well. I find Koiche’s story particularly inspiring. He took a daring leap of faith into an unfamiliar sea because he refused to accept a lesser (albeit comfortable) life. I too believe that sometimes we just need to jump. Fear of change and paralysis by analysis often gets in the way of dreams being pursued, much less realized. This was one hell of a risky move on his part, with a wife and 2 young children under 10 to support. Koiche insists that his wife was incredibly supportive from day one. The kids? Personally, I think it’s an invaluable life lesson to see one’s parents pursue their dreams, even if they fail, and not just tread water for the comfort of their children. Consider this question: if your own children’s potential and ambitions were compromised by themhaving kids, would you still want them to have kids? Are you paying for their private schools, piano lessons, and college extortion (I mean tuition) so that they can self-limit and underachieve? Do you counsel them to temper expectations about what is possible and prioritize instead around family comfort and well-being? Is this responsible parenting, or bounding their potential? If we don’t want our children to hold back, why do we hold back? This gets to a bigger question that I struggle with: what is our responsibility to our children when it comes to pursuing passions and living to the fullest? I’d love to get comments on this question. Koiche thought outside the box and made a dogged commitment to his goal. Who amongst us would consider a career move from chemical engineer to restaurant waiter sane? This was the first painful step along his Passion Plan. He realized he needed a better feel for how restaurants operated, and there is no better teacher than experience. Still, the move must have required lots of explaining. We can be swayed by the opinions and advice from friends, family, and coworkers. It’s easy to be worn down by a relentless tide of “what, are you crazy?” and “here’s what you need to do”, particularly when making changes as radical as Koiche’s. In the end, we will be remembered by the actions we took, not by the advice we followed. It is 9 pm on a Friday evening at Naruto. The small space is full and customers without reservations are being turned away. And I am not surprised. My udon vegetable soup is savory and hot and the 2 tempura shrimp sitting at the bowl’s edge are light and fresh, perfect with my frosty tall Supporo. Jess has the larger sampler plate – being a growing teen – and says Narotu has just made the “place we bring friends” list. Check it out, we think you’ll love it. Postscript: If you knew your death date, how would this knowledge affect your ambitions and sense of urgency? Obviously, what is done is done, the past is written. What about the future years, months, days, and moments left? Let me give you a reasonable date if you are an American and 40-50 years old: your 80th birthday plus 6 months (men subtract a year, women add a year; on average people live a half a year beyond their final birthday). Find that date and day of the week, write it on a piece of paper, place it in front of you, and take a look. Now, who is going determine the remaining content of your life story between this moment and that date?